To some, this may seem like a simple thing to wrap your head around. To others, it is a little more difficult to understand how lengths and font sizes work. The dimensions of the letters in your custom text will depend on the font you choose to use, as all fonts have different natural proportions (some are tall and long, others are short and wide). Here at VinylDisorder.com, we will never alter the natural proportions of a font by stretching or shrinking letters unless we are instructed to do so by you. 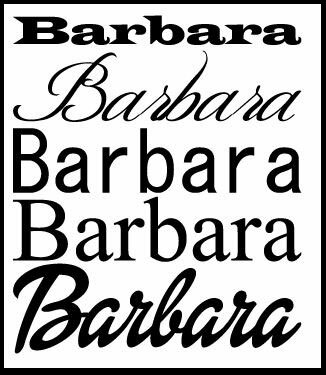 This photo shows how a 12″ custom name “Barbara” has different proportions when different fonts are chosen. As you can see, the first custom font is a lot shorter than the others, while the last font is significantly larger. Still, all of these Barbara’s are 12″ in length. If you choose a length for your custom decal, the more words you want to include in that total length, the smaller your words will get proportionally. Take a look at the photo below, for instance. 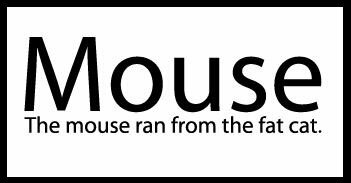 The single word “Mouse” and the text “The mouse ran from the fat cat.” were chosen in the same 12″ inch length. Mouse is significantly larger than the sentence because there are more letters that are trying to fit into the length that was chosen. The word “Mouse” would have to be ordered in 2.5″ in length to be proportional to the 12″ line that reads “The mouse ran from the fat cat”. Previous PostCustom Vinyl Monogram Decals- Rep your nameNext PostINSTAGRAM CONTEST WITH SELF33 – win FREE custom vinyl stickers! Enter now.